This summer was the season of water quality awareness. PFAS particles were found in high numbers in Parchment, Michigan. Flint, Michigan, residents are still wary of their water over four years after lead entered their water stream. Nationally, an online call to end the production of plastic straws gained major headway. Numerous businesses responded by cutting back their use of plastic straws, replacing them with sippy cup lids or no sipping mechanisms at all. The movement’s organizers argued that plastic straws were causing harm to all oceans. While evidence suggests that straws make a small percentage of the total plastic pollution in the ocean, the movement inspired an interest in plastic production, use, and disposal. Are the same plastic products polluting our oceans polluting our Great Lakes? According to the United States Geological Survey, not exactly. 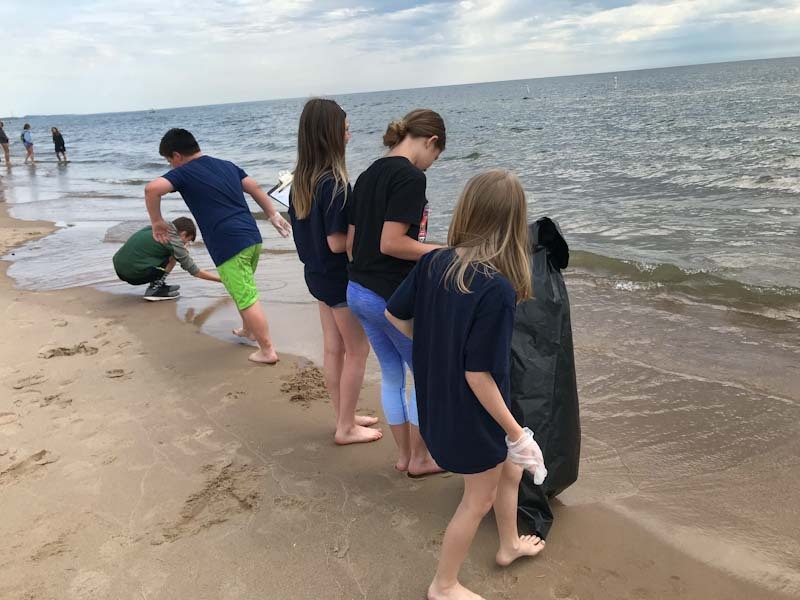 While items like fishing nets and wires are common plastic pollutants in oceans, the Great Lakes are swamped with pieces of everyday plastic materials — anything from a plastic bag shred to a sandbox shovel handle. Some plastic pollutant pieces tend to settle in Great Lakes tributaries, like the Grand River. Plastic fibers from clothing and microbeads from personal care products can be too small for the naked eye to see. These plastic pollutants — pellets, microbeads and microfibers — are collectively called microplastics. A Rochester Institute of Technology study found that 80 percent of shoreline litter was plastic. Right next to shore, an estimated 22 million pounds of plastic pollution enters the Great Lakes each year, 11 million in Lake Michigan alone. What scientists are still determining is how problematic this pollution is, said Dr. Alan Steinman, the Robert B. Annis Water Resources Institute Director at Grand Valley State University. Past experiments studied plastic pollution concentrations far higher than those in most Great Lakes samples, he said. Now, with water quality becoming a leading health concern, research reflective of the lakes is beginning to emerge. Regardless of concentrations, Steinman said that plastics can permeate water and food systems directly and indirectly. Plastics can be directly ingested by fish and plankton. Others are absorbed by chemicals, which are then ingested by organisms. These plastics then scale up the food web. Steinman said that the difference between plastic problems of the oceans and the Great Lakes depend on what chemicals are present and at what densities. Great Lakes-area environmentalists haven’t sat around the water, either. In 2015, former President Barack Obama signed into law a ban on manufacturing microbeads in personal care products. As of July 2018, no products with microbeads can be produced or bought. The Alliance of the Great Lakes (AGL) was one of the organizations that pushed hard for the ban five years back, after a study on microbeads was published. Nate Drag, AGL’s water project manager, called it a “perfect storm for a policy intervention.” Research lead to advocacy. The frustrating part, he said, is that microbeads’ miniscule sizes make them difficult to remove from the water system. Microfibers and other plastic pieces are tough to take out, too. 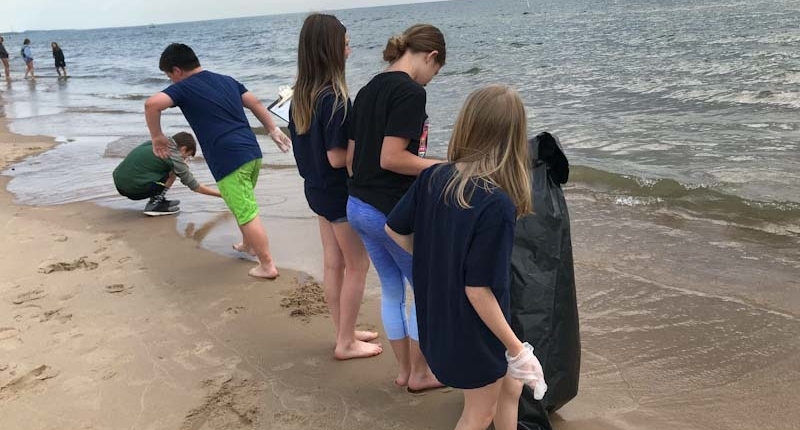 AGL volunteer groups have been cleaning Great Lakes beaches for years. 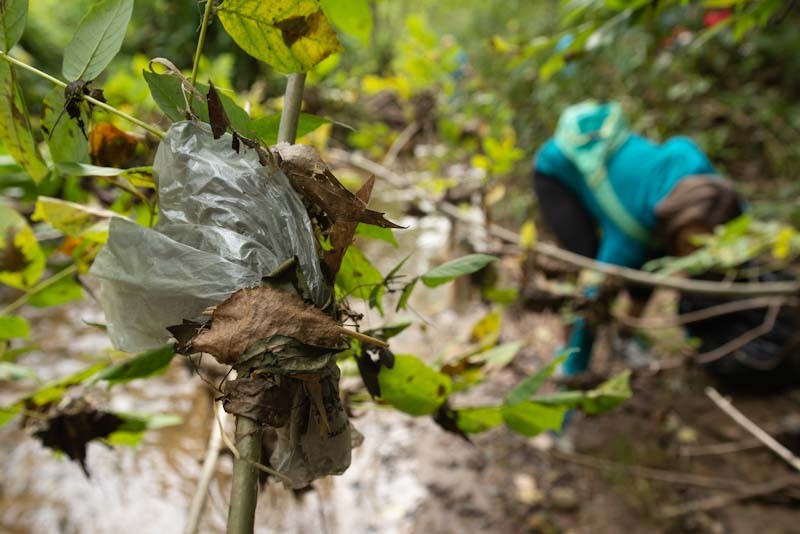 Despite collecting plastic pollutant data from each volunteer venture, actual pollution numbers are hard to determine because volunteers have a difficult time catching sight of microplastics, let alone picking all of them up. “It’s near impossible to get [microplastics] out once they’re out there, so there’s a lot of pressure on keeping them out of the water and looking at ways to reduce these at their source,” Drag said. Another problem arises in limiting plastic pollution. If bans on plastics are put in place, the purposes of each product would need to be considered. Drag compared a plastic bag ban to a straw ban. A plastic bag could be replaced with a reusable or natural alternative without placing impediments on any group of people — that is, aside from plastic bag producers. Banning plastic straws does place impediments. Shortly after the plastic straw movement took hold on social media, a counter movement arose. Disability rights advocates said that plastic straw bans would make it difficult for those with certain motor restrictions to drink in public settings. Now, some businesses have switched their plastic straw ban plans. Some offer straws made from paper. Others have plastic straws available upon request. “The tricky thing about plastic is they all contribute to the big overall concept of plastic pollution, but within that you have so many different items that could require so many different solutions,” said Drag. Creating change in the way the public treats plastic can seem as daunting as picking up every microplastic piece on a beach. Drag said individual efforts can go a long way. Drag emphasized education. At moments when bans can’t be implemented, laws cannot pass and corporations can’t be touched, behavior can be changed. Ashtrays, recycling bins and trash cans can be placed in targeted areas. Recycling bins with lids can be bought and trash screens can be placed over storm drains. Local officials can be made conscious of environmental worries. Stacey Trowbridge, program director for Disability Network Lakeshore, said she once advocated for a Kindergarten student with a peanut allergy. The issue was just coming to schools, and many teachers and parents were against the ban. When it comes to any issue, Trowbridge added, it’s best to consider all parties affected and to become educated on their struggles and strengths. who makes them. They are natural, easy to clean and last at least a year. We sell them for $1.00 a piece. Carry them with you in your car for the family if eating out. In your purse or small computer bag. Then bring them home and clean them like any utensil. They can even be washed in the dishwasher. We have stopped using plastic straws but one needs to be quick about it at the drive thru.